Apologize if you have seen this quilt in the making once to often but I promise these here are the last photos. Why ? Well because it is now finished. I started this beauty about 13 month ago at the first Fat Quarterly retreat where Tacha and Brioni taught me EPE with hexagons. The plan in the class was to make a cushion but I when I had finished my first set of hexies I had already changed my plan to make a baby sized quilt because I was so taken by what grew in front of my eyes. They do say EPE is addictive and I can attest to that. There is something very satisfying about making hexagons. 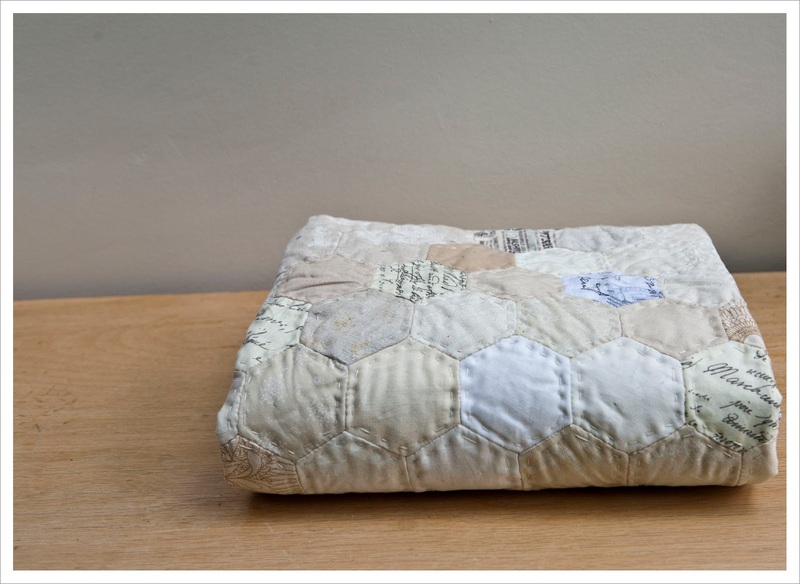 I quilted it by hand along the edges of each hexagon which was a bit painful to be honest. The quilt back is a gorgeous print from Windham Fabrics called 'Presents Books and Letters' that was gifted to me but is or was available at Tikki. I kept the binding simple and used one of the Muslin Mate prints I had in my stash as I don't want anything to distract from the beauty of the quilt top. 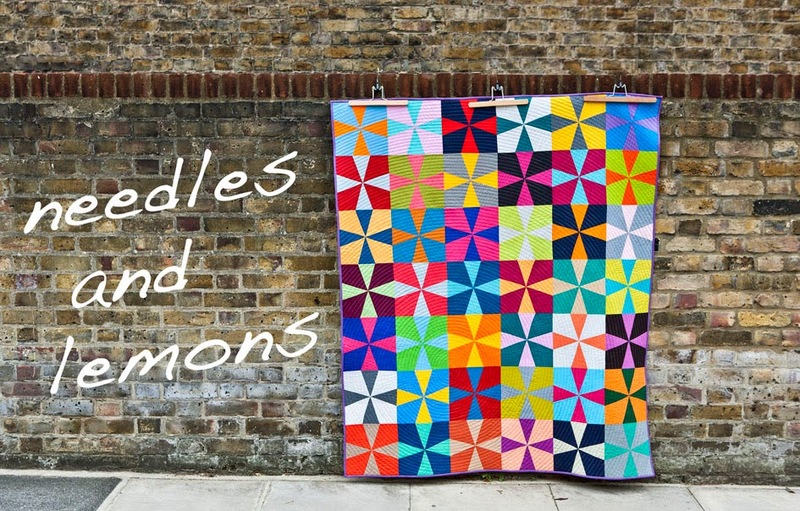 My plan was to only work on this quilt while traveling, hence the final name for it: On my travels I (you noticed the I, yep there will be more additions to the series). I stitched on the Eurostar on my way to see my parents in Germany. I stitched even more hours when staying at my parents. Then I stichted on airplanes to far flung countries, on holidays, on other train journeys through the UK and also a little bit at home in my Garden (full disclosure, short journey from indoors to outdoors, might that be a little bit of traveling ?). So I put the last stitches on the other day and added the binding this week and when I saw the finished piece I was even more in love with it than I was at the beginning. So much so that I already have started work on a large king size version of this but with 5" squares and NOT hexagons. I know Brioni would do that with Hexies in about 6 weeks but alas I can't and won't. 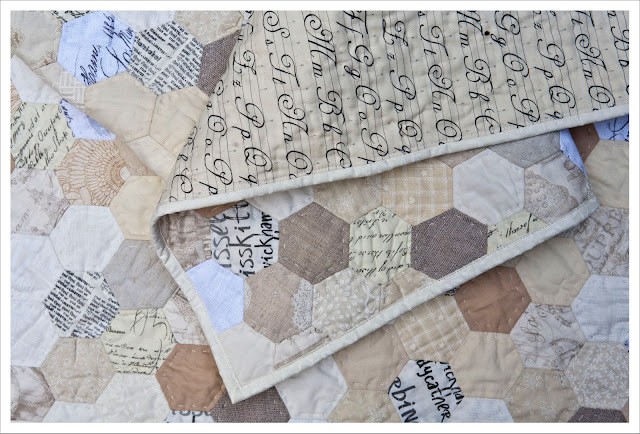 I am however convinced that a large quilt in squares will look just as good. 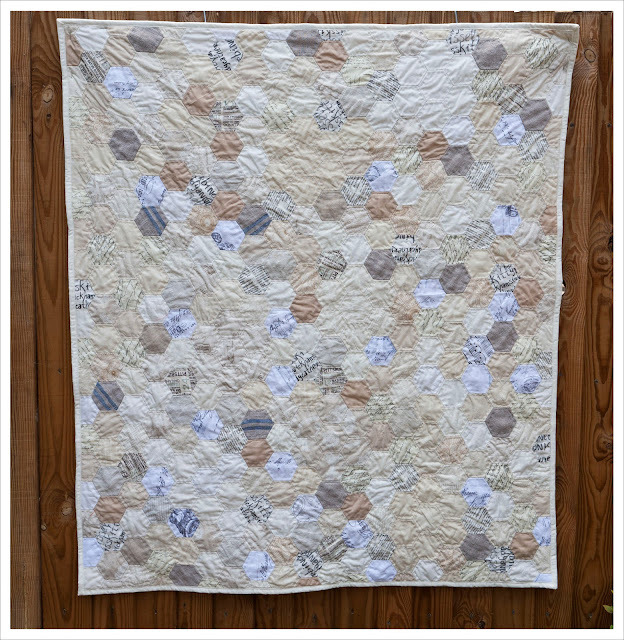 I have cut all the remaining fabric I had from this quilt and the collection of Moda Muslin Made I had (by the way the Fat Quatershop has a bundle of the newer editions available here) and already went to the Cloth House and bought a few pieces of rough linen to add to this. It will be glorious, I am sure of it. This quilt will be earmarked for a yet to be announced niece of nephew.......(so glad my brother does not read this blog). It's stunning Judith and I agree that a similar one with squares will be also wonderful. Lucky new baby to get it, a perfect gift. Oh my! Such a lovely, impressive accomplishment! 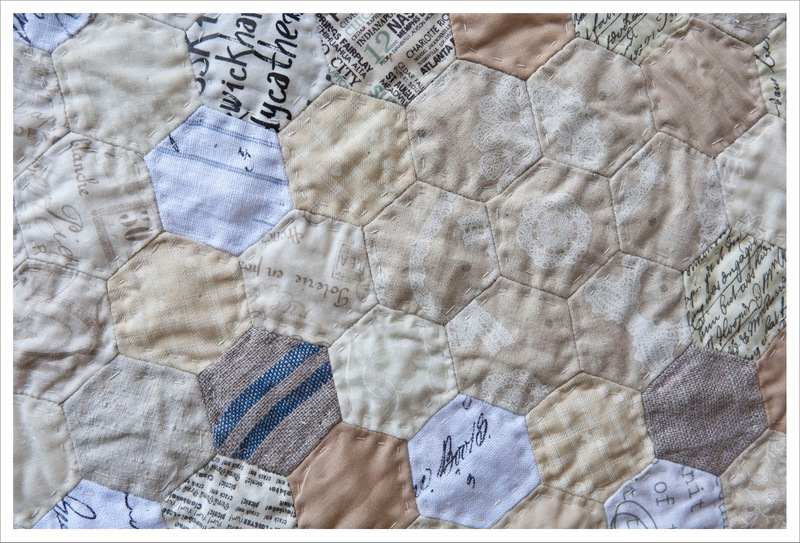 The texture resulting from the hexies and the hand quilting makes the quilt look so soft! I will have to start a traveling project! This little quilt will be so timeless. Beautiful low volume fabrics. I bet you got a few questions on the train. I agree with them being addictive too! I have been doing hexies for 12 years and will do them forever! This is such a beautiful calm and cosy looking quilt. Gorgeous! Lovely fabric choices - it works so well. Such a beauty, the colours are perfect. I'm almost tempted to have another go at EPP. 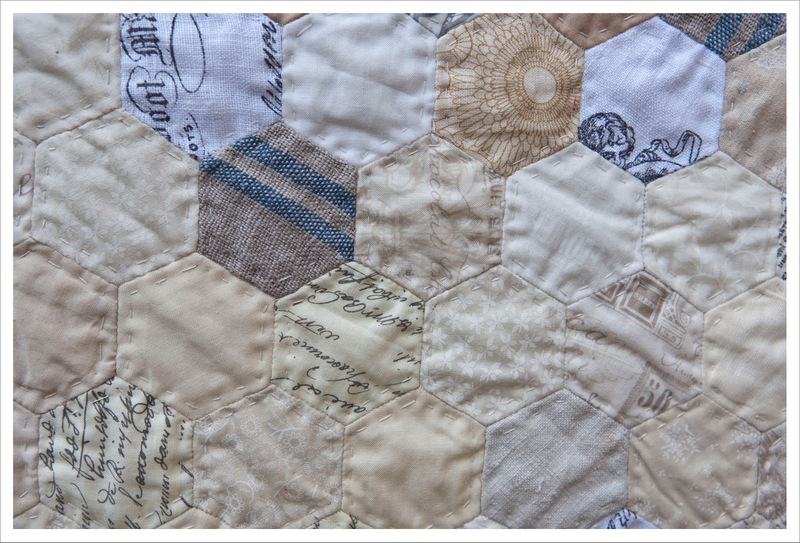 This quilt is such an achievement - all those wonderful hexagons and hand-quilting. Very nicely done. I think its the most restful, calming quilt I have ever seen. Its gorgeous and utterly inspiring. 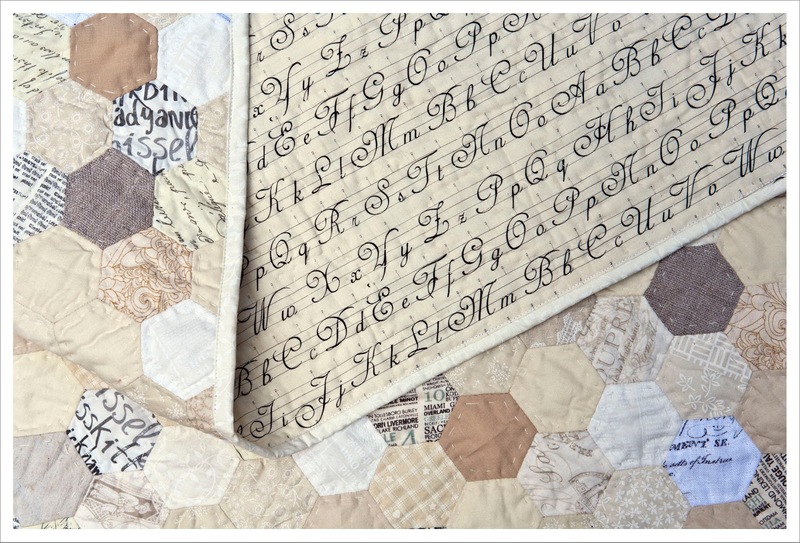 I adore this low volume hexagram quilt. Bravo! I am making my first hexie quilt right now and am stumped at how to finish it. Did you just bite the bullet and trim? Or did you sew 1/2 hexies along the edge to even it out a bit first? 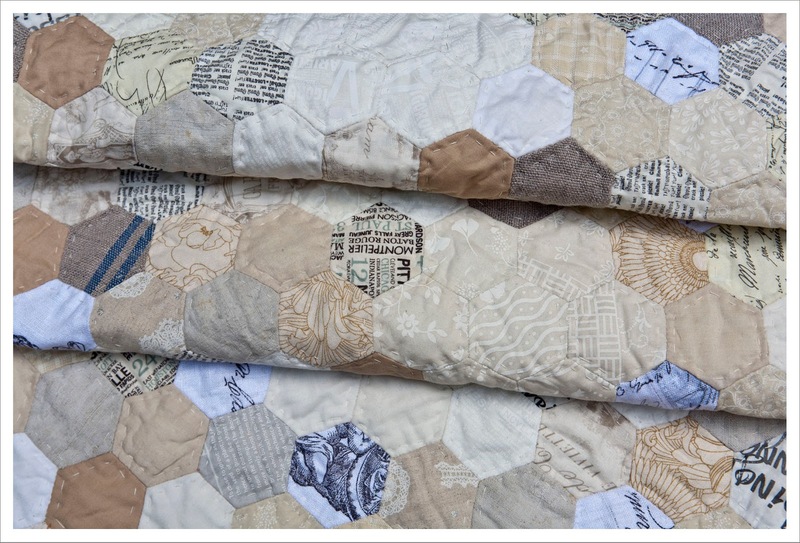 Oh so pretty quilt and cushion! I visited those site you linked to so I could get some of those linens, but nothing doing. Now I NEED to search the web/LQS to find some of my own!